The United States has million of new businesses sprouting up every year. It’s becoming more and more challenging to capture the attention of potential consumers and investors. The IdeaPros founders saw a need to help people with promising ideas find success in the volatile startup world. Their team is committed to elevating the odds of innovative products and apps finding success in the market. Who is your ideal customer? It’s important to find out this answer before starting a business of creating a new marketing plan. Below, the IdeaPros team shares how to find and keep the perfect customer for your business. Who is your ideal target market? Is your customer old or young? What is their gender? What type of community would they live in? Are they someone with kids or no kids, married or single, living alone or with others? Do they belong to a particular religion or ethnic group? Build that picture in your imagination. You may want to write it out so you can refer back to it. Another option is to share it with anyone helping you come up with marketing ideas. Once you understand who your customer is, you can use that to focus your marketing efforts. Your ideal customer is a member of a larger group of similar people. These people then become the target audience for your marketing. Understanding who that target audience is and where they get the information they use for buying decisions will help you shape how you reach them. Are they readers who love taking in written information from many different sources? Then your marketing might want to emphasize blogging and advertorial materials. Are they more visual? Then consider putting your information out as infographics, slideshows, or photographs on sites like Instagram and Pinterest. If product demonstrations are effective at selling, then a YouTube channel showing different ways to use the products could be the best investment for your marketing time and money. Once you have clear goals, keep checking in with them periodically to see that you are on track to meet them. Social media outreach is a great way to measure your progress in reaching your ideal customers. You can use surveys and giveaways to get your target audience to give you feedback on how you are doing, and what works best to reach them. Social media is a two-way street. Not only can you let your customers know what you are offering, but they will also tell you what they want. Respond to comments on your Facebook page, Twitter account, or blog posts. With minimal prompting, customers will tell you exactly what they are thinking! Business owners are often creative people whose ideas flow in many different directions. However, to keep a target audience and ideal customer in your sights, you need to figure out your niche and not wander too far from it. If you have established yourself selling healthy cooking products, for example, it might seem to make sense to expand into fitness products as another component of a healthy lifestyle. Before doing this, it’s important to check in with your target audience. Do those products interest them? Or have they found you and stuck with you for entirely different reasons? Perhaps they aren’t into exercise at all, and the main appeal of your products is convenience and ease of use more than the health benefits! Once you have carved a niche, it may be possible to break it down further into a sub-niche that would allow you to target an ideal customer more closely. Your niche may be products that appeal to home cooks. The sub-niche could be female home cooks who are also working moms. You can shape your product offerings and marketing to reach that particular sub-niche. A working mom isn’t interested in healthy cooking tools that are complicated to use and involve a lot of cleanups; there’s homework to get done, and bath time and bedtime to get on with! However, they will be interested in recipes that are quick to prepare and include ingredients that kids love to eat, so you can use those as a giveaway to get email subscribers or Facebook group participants. That is just one small example of how knowing your audience and your niche can make it easy to figure out what to sell and how to sell it. “As you focus your efforts, pay attention to who responds to your offers and who doesn’t. 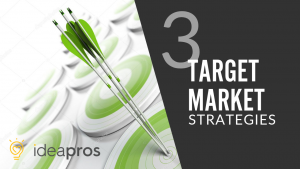 That will help you further get to know your target audience and keep zeroing in on that ideal customer,” suggested Michael Corradini, CEO & Co-Founder of IdeaPros. You may even be surprised by enthusiastic responses from a market segment you hadn’t expected and will be able to build that knowledge into future marketing. “You should always be flexible and keep an open mind as you work to market your business. But once you have established your ideal customer, stay laser-focused on them and dedicate your time and effort to reaching them and keeping them happy with and interested in your offerings,” stated Mr. Corradini. In a world of many distractions, it is all too easy for them to wander off to competitors if they begin to feel that you no longer understand or care about their needs. IdeaPros has made a name for themselves by helping entrepreneurs turn great ideas into profitable businesses. Over the years, their highly experienced team has built a reputation as being a leading strategic partner for startups.